How to focus anti-hunger efforts not on charity but on the root causes of food insecurity, making improvements to public health, and reducing income inequality. Food banks and food pantries have proliferated in response to an economic emergency. The loss of manufacturing jobs combined with the recession of the early 1980s and Reagan administration cutbacks in federal programs led to an explosion in the growth of food charity. This was once meant to be a stopgap measure, but the jobs never came back, and the “emergency food system” became an industry. 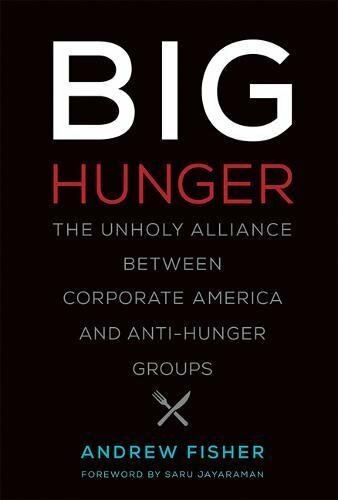 In Big Hunger, Andrew Fisher takes a critical look at the business of hunger and offers a new vision for the anti-hunger movement. From one perspective, anti-hunger leaders have been extraordinarily effective. Food charity is embedded in American civil society, and federal food programs have remained intact at the same time as other anti-poverty programs have been eliminated or slashed. But anti-hunger advocates are missing an essential element of the problem: economic inequality driven by low wages. Reliant on corporate donations of food and money, anti-hunger organizations have failed to hold business accountable for offshoring jobs, cutting benefits, exploiting workers and rural communities, and resisting wage increases. They have got transform a part of a “hunger industrial complex” that seems as self-perpetuating as the more famous military-industrial complex. Fisher lays out a vision that encompasses a broader definition of hunger characterized by a focus on public health, economic justice, and economic democracy. He points to the work of a large number of grassroots organizations that are leading the way in these fields as models for the remainder of the anti-hunger sector. It’s only through approaches like these that we will hope to end hunger, not just manage it.